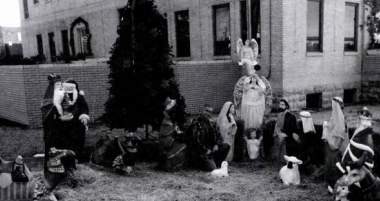 On November 12, a federal judge ruled that a Nativity scene erected on the lawn of an Arkansas county courthouse (shown) violates the First Amendment’s prohibition on the establishment of religion by the government. Additionally, the American Humanist Association claimed that Blackthorn was compelled to file the lawsuit because she experienced “direct and unwelcome personal contact” with the alleged establishment of religion. Such judicial attacks on religious faith — particularly the religious faith of Christians — is nothing new. For years, judges have given wide berth to the practices and rites of various religions, while regularly finding constitutional infringements in the actions of state and local governments that promote Christian values and holidays. It was about 50 years ago that the Supreme Court began applying the 14th Amendment to states in a way that “incorporated” the Bill of Rights to the states, having the effect of applying the Bill of Rights’ restrictions on the federal government to state and local governments, as well. Apart from its overt aim to marginalize the Christian religion and evict it from the public square, the incorporation doctrine pursued by the Supreme Court has eroded state sovereignty and severely weakened constitutional federalism. Some judges have pointed to the Constitution’s “silence” on public virtue and the explicit prohibition on the establishment of religion as evidence that the Founding Fathers wanted to keep religion out of government. They insist that the “wall of separation” between faith and government must be maintained. There is, however, another way of analyzing this issue that sets such statements on their ear. First, we all must understand that in no way did the Constitution eliminate or delegitimize the traditional religious jurisdictions of the states. The effect of this ailment on the role of faith and virtue in the United States has been devastating. The practices and habits once fostered by state and local institutions have been abolished, abandoned, and in some cases, criminalized. The old localized authorities disappear without either revival or replacement, and everywhere the central government succeeds them in the direction of affairs…. Everywhere men are leaving behind the liberty of the Middle Ages, not to enter into a modern brand of liberty, but to return to the ancient despotism; for centralization is nothing else than an up-to-date version of the administration seen in the Roman Empire. We are witnesses to the forceful surrender of state sovereignty by all three branches of the central government. The role of fostering virtue and Christian devotion once fostered by the state and local authorities is declared unconstitutional and the moral decline of our country accelerates. Finally, a closer reading of the Establishment Clause and a more dedicated study of the legislative history of the First Amendment reveals not only that our Founders did not intend for the prohibitions contained in that part of the Bill of Rights to apply to the states, but, on the contrary, they intended those limitations to preserve those very same prerogatives for the states and cities! Amar goes on to explain that by presuming to rule on the constitutionality of state and local acts that promote religion, the judges themselves are violating not only the letter, but the spirit, of the First Amendment. Often the enemies of the public display of religious faith (again, typically only if that faith is Christianity) will cite Thomas Jefferson as a proponent of their particular interpretation of the proper rule of courts in protecting the public square from any participation by people of faith or the emblems of their faith. Once again, these people demonstrate a woeful understanding of history. I am aware that the practice of my [presidential] predecessors may be quoted. But I have ever believed that the example of state executives led to the assumption of that authority by the general government, without due examination, which would have discovered that what might be a right in a state government, was a violation of that right when assumed by another. As this brief rehearsal of constitutional law and our Founders’ conception of it reveals, far from being a bar on a state or county’s erection of a Nativity scene, the First Amendment was specifically worded — “Congress shall make no law” — so as to prevent the federal government from infringing legislatively in any manner whatsoever on the authority of states and localities to promote and protect the religious faith of its people. In other words, the Establishment Clause that was intended by our founders to protect state efforts to promote virtue and religious faith from federal intrusion, is now being used by that same federal government not only to intrude on that authority, but to abolish it all together! In blatant disregard of these facts, however, federal judges such as Timonty L. Brooks continue to misunderstand, misinterpret, and misapply the Constitution’s Establishment Clause and continue using rulings to run religion out of town. Baxter County’s attorneys have not commented on their next move.